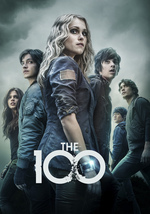 Members of the 47 still trapped in Mount Weather plot their escape, while all attempts to rescue them by Clarke and others are temporarily placed on hold as the Grounders threaten to wipe out the Ark survivors. The answer to the question of whether Lincoln can be saved from his reaper madness places the Arc survivors' fate up in the air as Jaha and Abby clash over the proper strategy to keep everyone safe by fleeing the impending attack or seeking another solution. I saw we skipped 7 for 8, and well, I'm a completionist! 3 got skipped too, by the way. I didn't notice in either case until after I'd already watched the next episode, at which point I didn't have much to say about the missed week. It sort of bothers me that the posts don't sort into episode order on the show's page, although that could cause problems for the shows with multiple runs through. I noticed that as well and found it disconcerting, too. Now that you pointed out three, I may be compelled to go back and toss it up, too. Thanks for getting the others up! Well, good for them for managing to salvage a Reaper. I'd turn Finn over. You can't blame them for that. What good is he anyway besides being cute at this point? Poor little Mount Weather pincushions.